English: The Different World Magic is too Behind! Published: Dec 22, 2016 to ? However, the world is in peril due to the Demon King. The kingdom's court magicians perform a summoning ritual for heroes and bring forth two youths, a boy and a girl. Unlike the girl, the young man refused to fight the Demon King and demanded to be sent back to his world. The kingdom, angry with his behavior, lock him away. 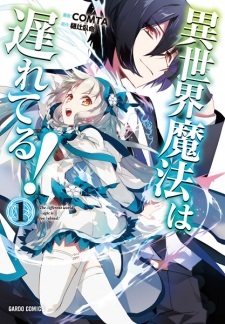 Alternative version: Isekai Mahou wa Okureteru! An interesting take on the summoned to another world non-rpg isekai. One of the three people summoned to be the demon king turns out to not want to fight. It also turns out that SPOILER.....he already knows magic....SPOILER END. The MC looks to be OP, but with a disinclination to fight. The pacing is good, the art is good, and the characters are more defined than in blander 6/10 Isekai. Only 5 chapters are translated as of March 9 2018. Worth it if you're looking for a quick read if you don't mind that there's not much in the way of material.